Two historic Atlas rocket launch gantries made of metal and memories were brought down by chest-thumping explosions Saturday morning, erasing Complex 36 from the Cape Canaveral skyline after five decades of space missions. Complex 36 was built in the early 1960s for Atlas-Centaur rockets that deployed many of NASA's early space exploration probes to Mercury, Venus, Mars, Jupiter and Saturn, plus robotic voyages to the moon that prepared for human landings. Dozens of satellites that expanded communications around the globe and bolstered U.S. national security also flew from the site's two pads over the years, making Complex 36 one of America's longest serving launch sites. Pad 36A saw 69 launches from 1962 through August 2004 and Pad 36B had 76 flights from 1965 until February 2005. But times change and the Atlas program opted to retired its older rocket configurations. The new Atlas 5 Evolved Expendable Launch Vehicle made its home at Complex 41 on the northern edge of Cape Canaveral Air Force Station, rendering Complex 36 no longer necessary. Lockheed Martin secured the complex following the final launch two years ago, removed equipment and turned over the site to the Air Force for a multi-million dollar decommissioning and cleanup project. The umbilical towers on the pads were torn down last fall and Saturday's explosive topplings of the 20-story mobile service towers completed the demise of the Atlas era at Complex 36. 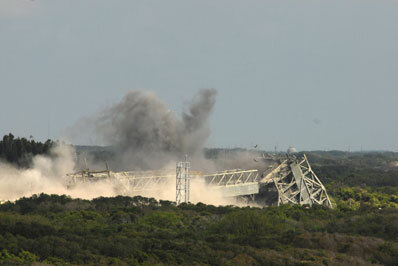 After a brief countdown on the warm, sunny morning, former Complex 36 workers, Air Force officials and the news media watched as pad 36B had its lower supports blown out, allowing the structure to tip over and smash into the ground at 9:59 a.m.
"All stations, good shot, good shot. Stand by for the next shot," one of the team members announced as smoke and dust rose from the crumpled heap. Then went pad 36A at 10:11 a.m. with more deafening explosions followed a few seconds later by the crushing sounds of impact. "These pads were part of the premier complex in the nation's journey into space. They will be remembered many years to come," Mark Cleary, the 45th Space Wing historian at the Cape, said after watching the gantries fall. 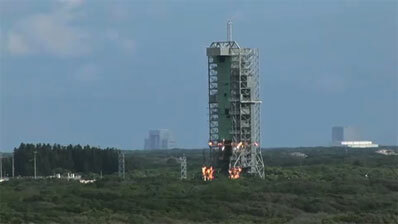 "It is an emotional feeling because of the history of it," added NASA spokesman and launch commentator George Diller. His first launch commentary was an Atlas flight from Complex 36. "But we still have a good feeling to know that the Atlas program, which really began at Complex 36, is going to be continuing." Some 122 pounds of explosives were used as part of the $500,000 tower toppling job, including 86 pounds of shaped charges to cut the steel, 20 pounds of detonator cord and 16 pounds of gelatin dynamite. It is considered much safer to dismantle the service towers on the ground than trying to take them apart while still standing. Demolition crews arrive Monday to cut up and haul away the towers. "A majority of the steel will be recycled," said project officer Jonathan Vanho of the Air Force's 45th Civil Engineering Squadron. The rest will be taken to the landfill at the air station. Work at the site is expected to be completed in two months, said Kevin Hooper, manager of the demolition project with Civil Engineering. The cost of maintaining the towers and safety concerns about leaving the structures untended forced the Air Force to level the pad. "We are demolishing it so that it doesn't corrode and become a safety problem. So we have to take the buildings down before nature takes them down," Hooper said. The cost per year to fight the corrosion from the salty sea air would be $100,000, Hooper estimated. The site could be reborn someday to launch more rockets. "There are programs that are looking for places to launch, but none have been selected. It is a potential site for another launch program. That is part of the reason to get the towers out of the way, too, to make it more attractive to future programs," Hooper said. Space Exploration Technologies had considered using the pad for its Falcon rockets. But SpaceX has since signed a deal to use the former Titan pad at Complex 40. For more on the history of Complex 36, you can read Spaceflight Now stories written following the final launches from each pad. More images of the toppling can be found here.